dipti kha series key hole fenders are the most versalite bow, stem fenders used on the tugs boats and small port crafts/ferries. They offer maximum protection to the tugs/ferries with its typical profile and loas absorbing capabilities. these are very easy to install and replace, thus making the maintenanace hassle free. These fenders are made of high abrasion resistance rubber with good resilience properties. They are very popular with small port craft owners and tug owners. These fenders are compression moulded in high pressure thermic fluid heated moulds and have excellent sea water resistance. 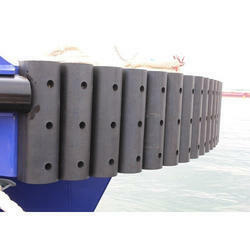 “DIPTI DSQ-A series square fenders are used on tugs, vessels, boats, etc. “DIPTI DSQ-A series square fenders also find extensive application on small jetties and fishery harbors. 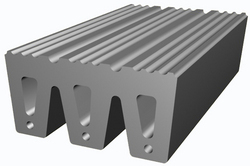 They are compression molded fenders generally used on tugs, boats and ships. Easy to install and replace. They have excellent sea water resistance, resistance to ozone aging and U V rays.